Are Artificial Sweeteners Bad For Us? Are artificial sweeteners bad for us? Well, that all depends on what articles you want to believe, who's responsible for writing them and whether they're fiction or fact. We must also remember that all the sweeteners that we can purchase readily at the supermarket have been tested, studied and approved by the FDA (Food and Drug Administration) before they can be put on the shelves for consumers to buy. In other words, when it comes to the food products we buy, they are only as safe as the quality job the FDA has done by testing and approving only those items that shouldn't pose any health threats to us, the consumer. So hopefully all products that we buy for consumption should be tested and proven safe. Artificial sweeteners are in huge demand and is a multi billion dollar industry. And it's no wonder because they offer a great way for us to still enjoy the sweetness of foods and beverages while decreasing our daily calorie intake. A genius concept if you ask me. Another plus is that artificial sugar substitutes do not contribute to tooth decay and obesity like regular sugar does. These artificial sweeteners are found in an abundance of products available today. These "sugar free" products are found in chewing gum, soft drinks, juices, baked goods, yogurt, candy, ice cream and so many more products. Artificial sugar substitutes give you cancer. According to the National Cancer Institute there is no concrete evidence that proves that artificial sweeteners present any health problems at all and that includes developing cancer. So far studies show that these sweeteners are safe when consumed in moderate amounts. Sugar substitutes can cause weight gain. The latest accusation is that sugar substitutes can cause weight gain. Though many have stated that their tests show this to be true, no real evidence yet has been provided proving this to be true. These zero calorie substitutes can help decrease daily calorie intake, which has helped many people achieve weight loss. Can be a useful sugar alternative for people living with diabetes. Saccharin was the very first artificial sweetener and was discovered in 1879 by accident by a chemistry assistant called Fahlberg. By 1917 the use of this sweetener sky rocketed in America and Europe. Splenda is the leading sweetener used in the U.S. today. It is derived from sugar and offers an almost calorie free solution. It was discovered in 1976 and approved by the United States government in 1998. Though a 1 gram packet of Splenda actually contains 3.36 kilocalories, it can still be legally labelled as zero calories due to the FDA regulations that a food containing less than 5 calories per serving can be labelled as a zero calorie food. Splenda can be used as a sugar substitute that can replace sugar in cooking and baking. Though this type of sugar cannot be caramelized it offers the same sweetness as sugar does without any artificial after taste. Truvia seems to be the latest trend when it comes to sweeteners. Its ingredients are erythritol (a sugar alcohol which is naturally found in fruits), extracts from the stevia leaf and natural flavors. 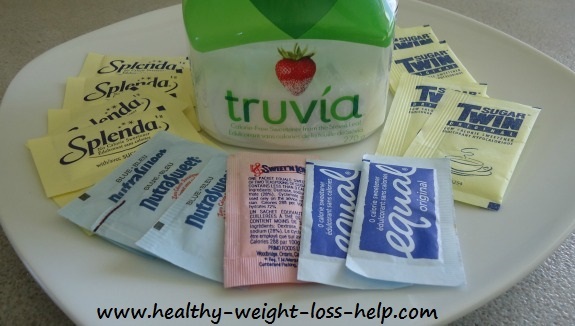 Truvia has become so popular that it has become the second best selling sugar substitute, but Splenda still remains the number one selling artificial sweetener sold for now. The main misconception of this tabletop sweetener is that it is all natural which is not true. Though it does use some natural ingredients it is still highly processed like the others. Because this sweetener contains sugar alcohols it can cause some gastrointestinal problems such as bloating, cramping, and diarrhea if eaten in large quantities. Contains virtually zero calories and is found in diet drinks and some foods such as yogurt. Truvia got its FDA approval in 2008. However, some UCLA toxicologists wrote a letter to the FDA stating that some of their lab tests showed that Truvia may cause mutations and DNA damage and they feel that further testing of the sweetener should be done. So until further testing is done consume Truvia in moderation. Has zero calories and is found in drinks, candy and canned goods. Some people avoid saccharin due to an old study. Studies using rats back in the early 1970's found that there may be a link between saccharin consumption and bladder cancer. More studies have been done since then leading up to the conclusion that due to the lack of evidence there is no proof whatsoever that saccharin causes cancer in humans. Sugar alcohols contain approximately 2.4 kcal per gram and is found in sugar free items such as candies, chewing gum and a variety of desserts. Eating large amounts of this sweetener may cause stomach bloating and diarrhea. Has zero calories and is found in some foods such as yogurt, drinks, gum and cough drops. Amongst all the sweeteners listed there has been more focus and research done on Aspartame than the others. Some older studies have labelled this sweetener as a culprit that can cause cancer. Aspartame was approved safe by the FDA in 1981 and more studies state that aspartame consumption in moderation is perfectly safe. Neotame has zero calories and was approved by the FDA in 2002. It is found in a variety of foods and drinks such as desserts and fruit juices. For more in depth information click here to go to the FDA home page (U.S. Food and Drug Administration). Since we know that the fist sweetener was created in the late 1800's and became popular by the year 1917 it is pretty safe to say we have had countless years to investigate the safety of this product. I think artificial sugars are great. They sweeten up our lives without increasing our daily calorie intake. They are so great in beverages, whether you're making coffee, tea or lemonade it can greatly improve the day. Have your say about what you just read. Leave us a comment in the box below.